What is ‘Mountain Dew Mouth’? Many people are aware of the negative health consequences of consuming too much soda like obesity or diabetes. The term “Mountain Dew mouth” was coined by public health advocates to specifically describe the phenomenon of eroded, brown teeth that result from the overconsumption of the sugary drink. Specifically, a region of the United States called Appalachia, which spans from southern New York to parts of Alabama, has faced unusually high incidents of Mountain Dew Mouth. There are many contributing factors to this phenomenon in Appalachia mountains including food stamps that allow the purchase of sodas, lack of access to dental care in these remote and underserved areas, and the overall popularity of Mountain Dew. 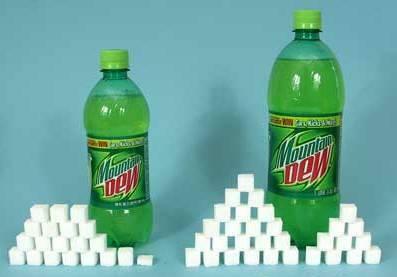 Although all types of soda contribute to tooth decay, Mountain Dew is seen as one of the most harmful to oral health because of its unusually high sugar content. In fact, recent studies have even compared the tooth decay effects of Mountain Dew on teeth to “meth mouth” because the rates of erosion are similar. The high sugar content in sodas interact with the bacteria that exist in our mouths to form an acid that attacks the teeth. Even diet sodas are extremely acidic and can still have a harmful effect on teeth. Constant contact between soda and tooth enamel causes the weakening of the enamel which leads to eroded and decayed teeth. Children and adolescents are even more impacted by this because their tooth enamel is still in development. Some ways to combat the harmful effects of any soda include: sipping soda from a straw, limiting your daily intake of the sugary drink, and drinking plenty of water throughout the day. Furthermore, dentists recommend that sodas should not be sipped for extended periods of time or shortly before bedtime.